You will be met at the designated meeting point and transferred to where the Athos awaits you at her moorings in Argeliers. A full-crew Welcome aboard follows, with Champagne and Mediterranean canapés. Once you are settled into your cabin, you will be invited to a 4-course dinner, prepared by our on board Chef and meet your wine guide for the week, Juliet Bruce Jones, a Master of Wine who has lived in the Languedoc for 10 years and is an expert on its wines. Enjoy a glass of excellent sparkling wine from Limoux while Juliet introduces this week of wine discovery. A fun, informative itinerary of visits to top wineries and vineyards, tastings winemakers, as well as tastings on board the Athos and fabulous local wines with food prepared by your on board chef. Enjoy your first breakfast sitting in a comfortable chair on the upper deck of ATHOS. This morning’s visit is a drive to the famous medieval double-walled city of Carcassonne with time to expore this historical city and browse those shops. Returning to the barge for lunch, the Captain gets ATHOS underway for an afternoon’s cruise to Pigasse, while Chef will serve up a local 3-course gourmet meal (perhaps including the famous duck confit stew, Cassoulet). By early evening you have arrived in Pigasse, where ATHOS’ mooring is beside the picturesque Pont du Pigasse. Juliet suggests a guided visit to Domaine Pierre Cros escorted by your guide. Pierre’s range of wines reflect his character – rebellious but Languedoc to the core. Top Minervois appellation wines rub shoulders with beguiling reds made from forgotten ancient vine varieties as well as ‘incomers’ such as Nebbiolo and Pinot Noir. Enjoy an evening tasting with your guide ‘Exploring Languedoc Wines’ of 6 Languedoc wines from top appellations when Juliet will explain what makes Languedoc wines so special. Dinner ‘al-fresco’ under the shade of the Plain trees. After breakfast, this morning’s suggested visit is a tasting at the Oulibo – the local olive oil pressoir. After tasting those organic and wholesome olives (accompanied, bien sûr by a small glass of rosé!! ), a short drive up the Gorge de la Cesse and into the hilltop village of Minerve is in order. Your guide will regale you with the harrowing tale of the Cathar siege launched at Minerve during the 13th C followed by a visit to Domaine Pierre Fil. This old family domaine makes only red wine and it’s main focus is Mourvèdre, a sun-loving grape variety which makes haunting, spicy wines. Stroll the vineyards and find out what “terroir” is really all about before tasting Pierre ‘s wines in his traditional tasting room. En route back to the Athos, your guide points out some of the many respectable Minervois wineries in the Gorge de la Cesse area, recommended by Wine Spectator is Chateau Coupe. Lunch on board and then the barge cruises to Capestang. ATHOS will be moored with a clear view of the flood lit St. Etienne cathedral. The village is a 5-minute walk. Dinner on board. After breakfast, we stroll into the village square where the morning market is being held. Taste some of the local winemakers’ fare, the local cheese-makers’ cheese, and the local butchers’ sausage. From the market, your guide suggests a tasting at one of the acclaimed Saint Chinian wineries: Cave Laurent Miquel who has revolutionised his family’s wine estate and acquired prime vineyards in St Chinian, Faugeres and Corbieres. 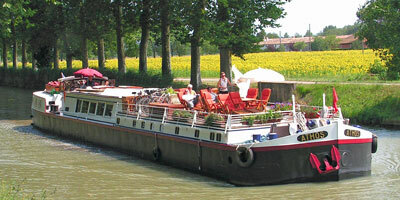 Return to the barge for lunch on board and then cruise to Fonserannes. This section of canal offers spectacular views of the Pyrenees across the sunny, clear plain. This evening’s mooring is the breath-taking viewpoint at the Fonserannes. Returning to the Athos for a game of Pétanque before dinner on board. Visit to weekly morning market in Narbonne. Even for non-shoppers, Narbonne offers much entertainment on a Thursday morning. Explore an excavated portion of the original Roman road, the Via Domitia, or, browse through the well-compiled Roman Museum, or, discover the beauty of St. Juste Cathedral, or, simply take a moment to blend into the scene. For wine enthusiasts who might like to purchase and ship certain bottles, Athos recommends our long-time Caviste at the Cave du Palais in Narbonne. Although shipping is costly, it can be arranged from here for those who are interested. After lunch we begin cruising through the 17th Century feat of engineering, the “Neuf Ecluses” (or staircase locks) followed by the 18thC Canal Bridge, which will carry the ATHOS over the Orb River. Today your guide takes you to visit a top vineyard Mas de Soleilla in La Clape, a rugged massif that separates Narbonne from the Mediterranean. Visit and learn how the terroir of la Clape is exceptional and is producing so many top wine estates. The evening’s mooring will be at the small village of Portiragnes. 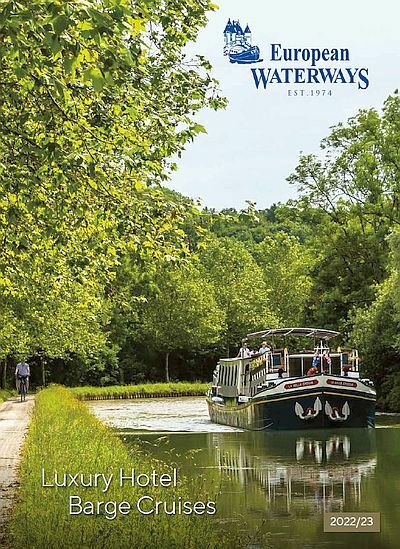 The paved towpath and the many locks leading to this village make it an ideal place for an evening walk or cycle before dinner on board. From the scenic mooring at Portiragnes, we get underway earlier than usual, cruising through the Petit Camargue where bulls stand casually in fields, Pink Flamingos grace estuaries, and African Rollers fly overhead. A spectacular (and appropriate!) seafood lunch awaits you, as you enter the open-waters of the Etang de Thau. The Etang hosts Europe’s largest Mussel and Oyster Park and Picpoul de Pinet will be available to accompany the seafood specialities according to the local pairing. As the barge comes to moor in the port at Marseillan, you will notice the enclosure which makes up the Noillly Prat Vermouth distillery. End a perfect day with a private tour of the Distillery with your guide — and, of course, a taste of Noilly Prat vermouth followed by an onboard tasting of a selection of local Picpoul de Pinet white wines! Chef’s efforts are sure to make this evening worth remembering! Your Captain will join your party for your final dinner on board this evening, and Juliet and Chef have put their heads together and carefully selected wines to impress and pair with the final meal. During the evening the Captain invites the crew to make a farewell toast with you. After breakfast transfer to the designated drop off point.